If you fancy taking a punt without risking your own money, Paddy Power﻿ is your best option. Everyone who creates a new account automatically gets a £10 no-deposit free bet. Plus you get a £5 free bet every week. The Racing Post app is the most downloaded horse racing app in the world and it's easy to see why. Their mobile racecards offer detailed information, including Racing Post Ratings, Topspeed Rating, latest prices, official ratings, age, weight and jockey/trainer form. The in-depth competitor files allow you to study the form on any iOS or Android device. The "Raceday Live" tab brings users the latest news, betting odds, results and commentary direct from the racecourse. The Racing U.K. app offer all the latest racecards, news and results from every racecourse in the United Kingdom, Ireland and South Africa. Their enhanced racecards provide information on the latest prices, jockey, trainer, owner(s), weights, silks, horse form, trainer and jockey form. 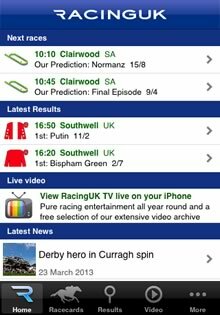 For betting advice use the apps inbuilt predictor or rely on Racing U.K.'s team of in-house tipsters. Equibase is the only app you'll every need for news and information on thoroughbred racing in the United States. 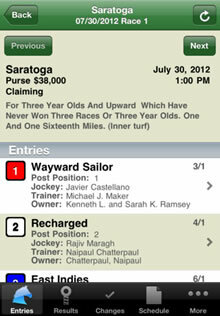 The free iPhone and Android apps provide results charts of the current and previous days racing. These result charts offer a summary of the entire race, including placings, descriptive narrative for each horse plus odds and payout information. Subscribers can watch replays of every race on their phone or tablet. Subscriptions start at $5.25 per day. 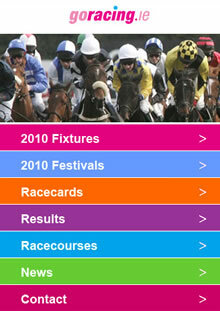 The GoRacing.ie iPhone app provides a wide range of information on horse racing in Ireland. It offers a comprehensive fixtures list that can be viewed either by month or by racecourse. The Festival section provides dates for every Irish race meeting, while the news section brings users the latest racing news from Ireland and worldwide. The app also provides racecards and results for every Irish race meeting. The app is particularly useful if you are planning a day at the races. The Racecourses section provides information on all 26 Irish racetracks, including Cork, Curragh, Down Royal, Dundalk, Fairyhouse, Galway, Killarney, Laytown, Peopardstown, Limerick, Listowel, Nass, Navan, Punchestown, Roscommon, Sligo, Thurles, Tipperary, Ballinrobe and more.